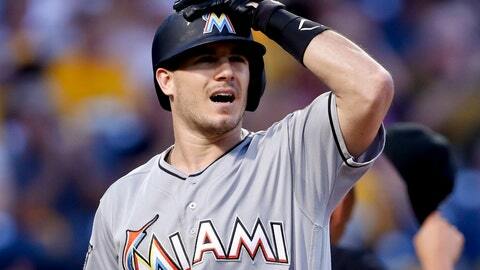 MIAMI (AP) — The agent for catcher J.T. Realmuto says his client has informed the Miami Marlins he won’t sign a long-term contract, increasing the likelihood the team will trade yet another All-Star. The Marlins have said they’d like a lengthy deal with Realmuto, but they’re coming off their ninth consecutive losing season and in a rebuilding phase that will probably continue for several years. Realmuto doesn’t become eligible for free agency until after the 2020 season and would command a considerable return in a trade. “I think he will definitely be wearing a different uniform by the start of spring training,” said his agent, Jeff Berry, on MLB Network Radio on Tuesday. A new deal with Realmuto would send a signal the team’s roster might no longer be a revolving door as players depart when they become too expensive. But the catcher asked to be traded a year ago when the Marlins dismantled under new CEO Derek Jeter, and a 98-loss season apparently didn’t change Realmuto’s desire to play elsewhere. Realmuto, 27, made the All-Star team for the first time this year and had 21 homers and 74 RBIs, both career highs, while batting .277. He had a $2.9 million salary this year after losing in arbitration, and he is eligible for arbitration this winter and again following the 2019 season.